According to an announcement made by Russia’s Rubin Kazan officials early Friday, Sardar Azmoun has signed a contract to rejoin his former club. The Iranian football also held a photo-op session with reporters with his new #33 shirt. This agreement dashes the hopes of Italian side Lazio, whom reportedly had an offer on the table for the attacker, for at least another season. It also ends the saga of a dispute between Rostov and Rubin Kazan clubs, where both argued over the ownership of the player. Russian top division side, Rubin Kazan was the first club in Azmoun’s senior career. Joining Rubin Kazan in 2013 and playing at Europa League, he soon attracted interest from several European teams such as Arsenal, Liverpool, and AC Milan. Sardar Azmoun’s highlight of his career though was during his playing time as a Rostov player. Playing in UEFA Champions League for the first time, he appeared in 14 games and scored 5 goals against European opponents, most notably against Atletico Madrid and Bayern Munich. Sardar Azmoun’s goals at Champions League and his young age, attracted several teams’ scouts this Summer, including Everton, Celtic, and Lazio. 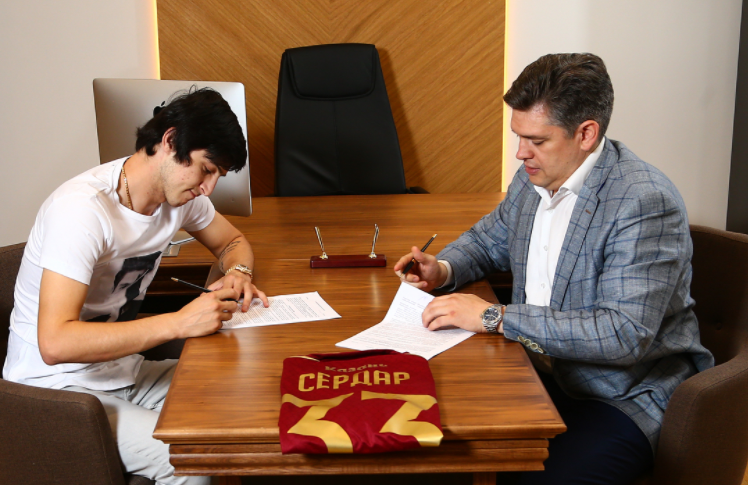 With this agreement, Sardar Azmoun has signaled his desire to stay in Russian league for another season, at least, and has postponed his transfer to top leagues, until after the 2018 World Cup. Rubin Kazan finished 9th in Russia’s standing last season, and will not play in UEFA Champions League next season.